Endowed Chair Professor, Yabumoto Department of Intractable Disease Research, Research Institute for Microbial Diseases, Osaka University. Univ. of Tokyo (B.Agr.Sci., 1974; M.Agr.Sci., 1977), Graduate School of Medicine, Osaka Univ. (Ph.D., 1981). JSPS Research Fellow (1981); New York Univ. Post-doc (1982); Research Associate (1982) and Assistant Professor (1988), Osaka Univ. School of Medicine; Professor, Research Institute for Microbial Diseases, Osaka Univ. (1990); Director, Research Institute for Microbial Diseases (2003); Deputy-Director, Immunology Frontier Research Center, Osaka Univ. (2007). Current position since 2017. Osaka Science Prize (2001), The Commendation for Science and Technology by the Minister of Education, Culture, Sports, Science and Technology of Japan (2010), IGO Award 2015, Takeda Medical Prize (2017), JSI Human Immunology Research Award (Japanese Society for Immunology, 2017). Main research topics are complement system and glycosylphosphatidylinositols. Many eukaryotic cell surface proteins are anchored to the outer leaflet of the plasma membrane by the glycolipid GPI that is covalently attached to the carboxy-terminus (Figure 1). More than 150 kinds of GPI-anchored proteins (GPI-APs) are known to exist in the human body acting as hydrolytic enzymes, receptors, adhesion molecules, complement regulatory proteins and prions1, 2. GPI-APs are particularly abundant in parasitic protozoa, a major form of membrane proteins3. Some protozoa have GPI anchor-like but non-protein-linked glycolipids on their cell surface. Pathogenic and non-pathogenic fungi have many kinds of GPI-APs; for example, about 60 of 6,000 genes of budding yeast Saccharomyces cerevisiae encode GPI-APs. A unique feature of fungal GPI-APs is that some of them are incorporated into the cell wall by a cleavage in the glycan moiety and transglycosylation4. Prokaryotes do not have GPI-APs. Exceptionally, Mycobacteria such as Mycobacterium tuberculosis have abundant GPI-like glycolipids. Mycobacteria have phosphatidylinositol (PI) as a major membrane phospholipid and generate three types of polymannosylated PI, phosphatidylinositolmannosides (PIM), lipomannan (LM) and lipoarabinomannan (LAM). These GPI-like glycolipids do not act as membrane anchors of proteins but instead exist as components of cell wall5. LAM and PIM of M. tuberculosis are ligands of C-type lectin receptors on host immune cells and activate the immune system6. It is likely but not definitively shown that Archaea have GPI-APs. There are reports that Sulfolobus acidocaldarius has membrane proteins containing components of GPI such as ethanolamine phosphate, that some Archaea proteins have a C-terminal sequence likely to be a GPI-attachment signal sequence and that genes homologous to eukaryotic genes involved in biosynthesis of GPI are found in genomes of some Archaea7, 8. GPI comprises glycan, inositol phospholipid and ethanolamine phosphate (EtNP) that connects the protein and the glycan. 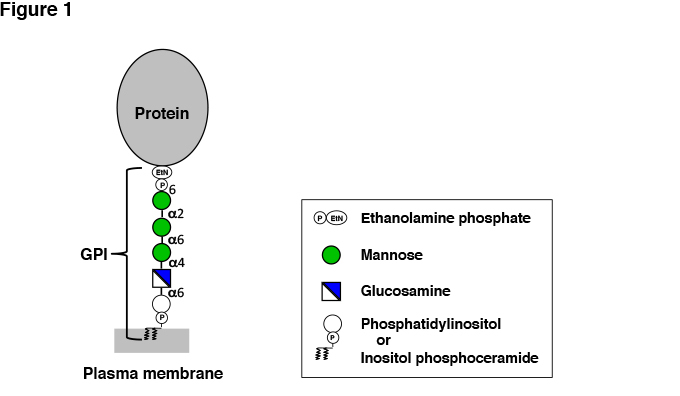 The GPI core, consisting of EtNP, three residues of mannose (Man), glucosamine (GlcN) and inositol phosphate, is conserved among eukaryotes (Figure 1). An amino group of EtNP forms an amide bond with the C-terminus of the protein. EtNP-6Manα-2Manα-6Manα-4GlcNα-6myoInositol-P-lipid is the common core structure. A unique feature of the GPI glycan is the presence of non-N-acetylated GlcN. The core may be modified by various side chains in different organisms and in different organs and tissues of one organism, introducing structural variation to the GPI anchors. The inositol phospholipid moiety varies among organisms and tissues. In mammalian cells, 1-alkyl-2-acyl PI is the major form and diacyl PI is the minor form. In yeast Saccharomyces and other fungi such as Aspergillus, diacyl PI form and inositol-phospho-ceramide form coexist. (Inositol-phospho-ceramide form is included in GPI although it is not PI by definition.) GPI-APs in human and mouse epididymis and in some protozoa have 1-alkyl-2-lyso PI with an inositol ring acylated (palmitoylated) at the 2-position. T. brucei, a protozoan parasite, is distributed in sub-Saharan countries of Africa and causes African sleeping sickness in humans and Nagana disease in livestock. T. brucei is transmitted by blood-sucking tsetse flies. The trypanosomes are injected into human tissue through bites by tsetse flies bearing the parasites in the salivary gland. The trypanosomes proliferate in the blood plasma and cause acute febrile illness. Relapse may follow, and in the late stage of infection, central nervous system symptoms including daytime somnolence may result. If left untreated, disease can lead to coma and death. African sleeping sickness and Nagana disease are caused by BF parasites. Cells of BF parasites are covered by 107 molecules of variant surface glycoproteins (VSGs) (Figure2A) , which are GPI-AP2. VSGs form a densely packed protective coat against host complement3. It is believed that since VSGs consist of GPI-APs they exist in a more densely packed form than transmembrane proteins on the plasma membrane. T. brucei has more than 1,000 isoforms of VSG genes in the genome. Only one of them is expressed at a time and the coat consists of single isoform of VSG. The VSG coat is critical for BF parasites to survive and proliferate in blood plasma containing a high level of complement. However, when antibodies against VSG are generated by the host immune system, BF parasites are killed by the actions of anti-VSG antibodies and activated complement. BF parasites evade this host immune response by gene conversion-mediated switching of the expressed VSG to another isoform that has a different antigenic property. The antibodies against the initially expressed VSG isoform do not bind to the newly expressed VSG so the parasites having a coat of the new VSG isoform survive and proliferate. This process of immune response and VSG isoform switching is repeated and infection is maintained9. In addition to VSGs, BF parasites express GPI-anchored receptors for transferrin at the flagella pocket where endocytosis occurs10. The transferrin receptor is essential for survival of BF parasites. GPI biosynthesis is essential for survival and growth of BF parasites. This was shown genetically by a TbGPI10 gene knockout experiment. TbGPI10 encodes a mannosyltransferase required for the addition of the third Man into GPI11. TbGPI10-knockout BF parasites could not be obtained unless a TbGPI10 expression plasmid was introduced. Furthermore, the TbGPI10-knockout BF parasites could not eliminate the TbGPI10 expression plasmid. Lack of the transferrin receptor accounts for the essentiality of GPI for BF parasites12. Physical fragility caused by the loss of the VSG coat may also contribute to death in culture. The essentiality of GPI biosynthesis for BF parasites was also shown biochemically. These results suggest that the GPI biosynthetic pathway is a potential target in the development of anti-T. brucei drugs effective against African trypanosomiasis12. Substrate analogs that selectively inhibit the T. brucei enzyme but not its mammalian counterparts have been generated by taking advantage of the different substrate specificities of T. brucei and mammalian GlcNAc-PI de-N-acetylases which catalyze the second step in GPI biosynthesis13. BF parasites in blood of mammalian hosts eventually stop proliferating and begin differentiating. When such parasites are ingested into tsetse fly intestine (midgut) by blood sucking, the parasites differentiate to PF that survive in the midgut and proliferate (Figure 2B). PF parasites express coat proteins called procyclins that are also GPI-APs14. To adapt to the environment in the midgut where digestive enzymes are abundant, the parasites quickly change the coat from VSG to procyclins. There are two types of procyclins: EP procyclin containing repeats of glutamic acid-proline dipeptides and GPEET procyclin containing repeats of glycine-proline-glutamic acid-glutamic acid-threonine pentapeptides. GPI anchors of procyclins have a polylactosamine side chain that is modified by many sialic acid residues linked to galactose residues15 (Figure 2B). Procyclins protect PF parasites from tsetse fly digestive enzymes by generating a glycocalyx layer with their GPI anchors bearing a bulky sialilated polylactosamine side chain. T. brucei does not have a sialic acid biosynthetic pathway. However, PF parasites do have a large amount of sialic acid attached mainly to GPI anchors. PF parasites obtain sialic acid from sialoglycoconjugates of red blood cells and plasma in the blood meal by trans-sialidases that transfer sialic acid from sialic acid-containing glycoproteins and glycolipids to galactoses of procyclin GPI anchors16. Trans-sialidases expressed on PF parasites are GPI-APs. GPI is not essential for PF parasites because the TbGPI10 gene was disrupted in PF parasites without affecting growth in a flask. GPI is, however, critical for fast growth of PF parasites in tsetse fly midgut because trans-sialidases are essential for acquisition of sialic acid17. Malaria, distributed widely in tropical and semitropical regions, is caused by protozoan parasites of genus Plasmodium that are transmitted by Anopheles mosquitoes. Five species of Plasmodium parasites cause malaria in humans. Among them, P. falciparum and P. vivax are major agents. In contrast to extracellular parasite T. brucei, malaria parasites grow in the host cells. Sporozoites that exist in salivary glands of mosquito vectors enter the bloodstream during blood sucking and quickly invade liver hepatocytes. After a non-symptomatic period, merozoites differentiated from sporozoites are released from hepatocytes into the bloodstream and invade red blood cells, initiating an erythrocytic life cycle. A cycle of proliferation, release and invasion is repeated and symptoms appear when parasites are released by ruptured red blood cells. Red blood cells infected by P. falciparum adhere to the capillary endothelium and cause severe damage to the brain and kidney. Sporozoites that establish infection after exiting from the salivary glands are coated by GPI-AP circumsporozoite proteins (CSP) 18. Merozoites that cause major symptoms also express a large number of GPI-APs such as merozoite surface protein 1 (MSP1) 19 (Figure 2C) . GPI released from P. falciparum merozoites or parasite-infected red blood cells contributes to severe symptoms by causing production of cytokines such as TNFα (GPI toxin). The lipid moiety of P. falciparum GPI is likely responsible for cytokine induction because its structure is different from that of human GPI. Chemically synthesized GPI glycan conjugated with carrier protein KLH has been shown to be an effective vaccine in a mouse model of severe malaria20. T. gondii, an intracellular protozoan parasite like Plasmodium, is a causative agent of toxoplasmosis. Congenital toxoplasmosis caused by vertical infection from mother to fetus is characterized by hydrocephalus, psychomotor development delay and visual impairment. T. gondii infection in immune intact individuals is usually asymptomatic whereas infection in immunocompromised individuals may cause severe toxoplasmosis characterized by pneumoniae and encephalitis. Tachyzoites that proliferate actively express a large number of GPI-APs and non-protein-linked free GPI. The free GPI has a glucoseα1-4GalNAcβ1-4 disaccharide side chain linked to the first mannose21 (Figure 2D). The free GPI is released from the parasite surface and is highly immunogenic, inducing IgM antibody response in the host. Yeast Candida albicans, a causative agent of opportunistic infections, has 104 kinds of GPI-APs which have either been experimentally proven or predicted to be GPI-AP. GPI of C. albicans has been examined based on knowledge of well-studied GPI of budding yeast Saccharomyces cerevisiae. GPIs of the two yeasts are related and appear to be basically similar (Figure 2E). A unique characteristic of yeast GPI-APs is that whereas many GPI-APs are associated with plasma membrane similar to those of mammalian cells and protozoan parasites, some GPI-APs are incorporated into the cell wall4. The lipid moiety in GPI of plasma membrane-associated yeast GPI-APs consists of inositol-phosphoceramide containing a very long (C26) saturated acyl chain. 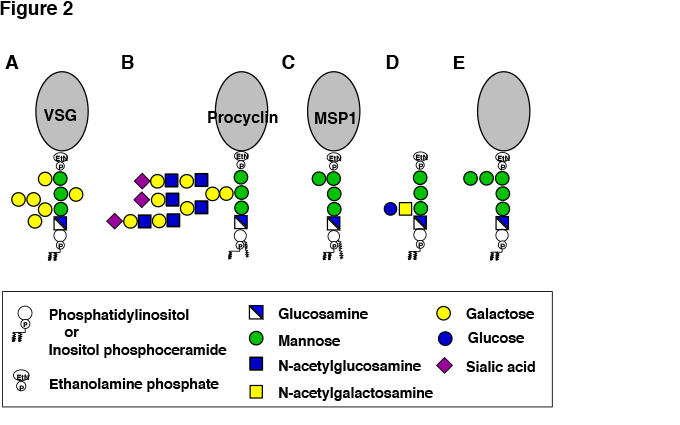 In contrast, GPI of cell wall-associated GPI-APs has diacyl phosphatidylinositol and after transport to the plasma membrane is cleaved between glucosamine and the first mannose, followed by transglycosylation-mediated incorporation into cell-wall glucans. The cell wall-associated GPI-APs are critical components of the cell wall because yeasts defective in GPI biosynthesis have functionally defective cell wall. The enzyme involved in the transfer of GPI-APs from plasma membrane to cell wall may be a good target of investigation in the development of anti-fungal drugs. During GPI biosynthesis in the endoplasmic reticulum, the first intermediate GlcNAc-PI is N-de-acetylated to generate GlcN-PI, which is then acylated at the 2-position in the inositol ring, generating the third intermediate GlcN-(acyl)PI. The inositol acylation, mainly palmitoylation, is mediated by acyl transferase Gwt1p in budding yeast and by PIGW in mammalian cells4. Although Gwt1p and PIGW are homologous enzymes, drugs that selectively inhibit Gwt1p and kill some fungi have been reported22. It was shown that development of pathogen selective drugs targeting GPI biosynthesis pathway is possible even when the mammalian host has a homologous enzyme. The GPI anchor containing inositol-phosphoceramide rather than PI is a characteristic of fungal GPI-APs, which exist not only in yeast but also in other fungi such as Aspergillus fumigatus, a causative agent of aspergillosis. The inositol-phosphoceramide moiety is generated through lipid remodeling reaction(s) after attachment of PI-containing GPI to the protein. CWH43 gene is required for the lipid remodeling but the enzymatic mechanism remains unclear4. Fig. 1　Structure of GPI-AP. Fig. 2　Structures of GPI-APs and free GPI of pathogenic microorganisms. A, VSG of bloodstream form Trypanosoma brucei. B, Procyclin of procyclic form T. brucei. C, MSP1 of malaria parasites. D, Free GPI of Toxoplasma gondii. E, GPI-APs of fungi. 1. Kinoshita, T. Biosynthesis and deficiencies of glycosylphosphatidylinositol. Proc Jpn Acad Ser B Phys Biol Sci 90, 130-143 (2014). 2. Ferguson, M.A.J., Hart, G.W. & Kinoshita, T. Glycosylphosphatidylinositol Anchors. in Essentials of Glycobiology (eds. rd, et al.) 137-150 (Cold Spring Harbor (NY), 2015). 3. Ferguson, M.A. The structure, biosynthesis and functions of glycosylphosphatidylinositol anchors, and the contributions of trypanosome research. J. Cell Sci. 112, 2799-2809 (1999). 4. Orlean, P. Architecture and biosynthesis of the Saccharomyces cerevisiae cell wall. Genetics 192, 775-818 (2012). 5. Morita, Y.S., et al. Inositol lipid metabolism in mycobacteria: biosynthesis and regulatory mechanisms. Biochim Biophys Acta 1810, 630-641 (2011). 6. Ishikawa, E., Mori, D. & Yamasaki, S. Recognition of Mycobacterial Lipids by Immune Receptors. Trends Immunol 38, 66-76 (2017). 7. Kobayashi, T., Nishizaki, R. & Ikezawa, H. The presence of GPI-linked protein(s) in an archaeobacterium, Sulfolobus acidocaldarius, closely related to eukaryotes. Biochim. Biophys. Acta 1334, 1-4 (1997). 8. Meyer, B.H. & Albers, S.V. Hot and sweet: protein glycosylation in Crenarchaeota. Biochem Soc Trans 41, 384-392 (2013). 9. Gadelha, C., Holden, J.M., Allison, H.C. & Field, M.C. Specializations in a successful parasite: what makes the bloodstream-form African trypanosome so deadly? Mol Biochem Parasitol 179, 51-58 (2011). 10. Borst, P. & Fairlamb, A.H. Surface receptors and transporters of Trypanosoma brucei. Annu Rev Microbiol 52, 745-778 (1998). 11. Nagamune, K., et al. Critical roles of glycosylphosphatidylinositol for Trypanosoma brucei. Proc. Natl. Acad. Sci. USA 97, 10336-10341 (2000). 12. Ferguson, M.A.J. Glycosylphosphatidylinositol biosynthesis validated as a drug target for African sleeping sickness. Proc. Natl. Acad. Sci. USA 97, 10673-10675 (2000). 13. Smith, T.K., et al. Specificity of GlcNAc-PI de-N-acetylase of GPI biosynthesis and synthesis of parasite-specific suicide substrate inhibitors. Embo J 20, 3322-3332 (2001). 14. Vassella, E., Butikofer, P., Engstler, M., Jelk, J. & Roditi, I. Procyclin Null Mutants of Trypanosoma brucei Express Free Glycosylphosphatidylinositols on Their Surface. Mol Biol Cell 14, 1308-1318 (2003). 15. Treumann, A., et al. Structural characterisation of two forms of procyclic acidic repetitive protein expressed by procyclic forms of Trypanosoma brucei. J. Mol. Biol. 269, 529-547 (1997). 16. Montagna, G., et al. The trans-sialidase from the african trypanosome Trypanosoma brucei. Eur. J Biochem. 269, 2941-2950 (2002). 17. Nagamune, K., et al. Surface sialic acids taken from the host allow trypanosome survival in tsetse fly vectors. J Exp Med 199, 1445-1450 (2004). 18. Wang, Q., Fujioka, H. & Nussenzweig, V. Mutational analysis of the GPI-anchor addition sequence from the circumsporozoite protein of Plasmodium. Cell Microbiol 7, 1616-1626 (2005). 19. Das, S., et al. Processing of Plasmodium falciparum Merozoite Surface Protein MSP1 Activates a Spectrin-Binding Function Enabling Parasite Egress from RBCs. Cell Host Microbe 18, 433-444 (2015). 20. Schofield, L., Hewitt, M.C., Evans, K., Siomos, M.A. & Seeberger, P.H. Synthetic GPI as a candidate anti-toxic vaccine in a model of malaria. Nature 418, 785-789 (2002). 21. Tsai, Y.H., Liu, X. & Seeberger, P.H. Chemical biology of glycosylphosphatidylinositol anchors. Angew Chem Int Ed Engl 51, 11438-11456 (2012). 22. Watanabe, N.A., et al. E1210, a new broad-spectrum antifungal, suppresses Candida albicans hyphal growth through inhibition of glycosylphosphatidylinositol biosynthesis. Antimicrob Agents Chemother 56, 960-971 (2012).